A small church community with a big heart. A warm welcome awaits you at our little village church in Moulsoe. This ancient church stands proud at the centre of the village – and has done so for the last eight hundred years or more. While formally dedicated to the Assumption of the Blessed Virgin Mary, the church is generally known as St Mary’s. Services are currently held here twice a month, and are always followed by tea, coffee and biscuits – or more - and a chance to catch up with village life. Moulsoe is essentially still a farming community, so our pattern of worship is structured very much around the agricultural year, with Plough Sunday, Rogation and Harvest key elements of this that are celebrated here with real meaning. The church is also a very special place on Mothering Sunday, or at Easter and Christmas. The services are complemented by events such as our Lent Supper, Summer Lunch and Harvest Supper – mostly held at Moulsoe’s impressive Millennium Hall. 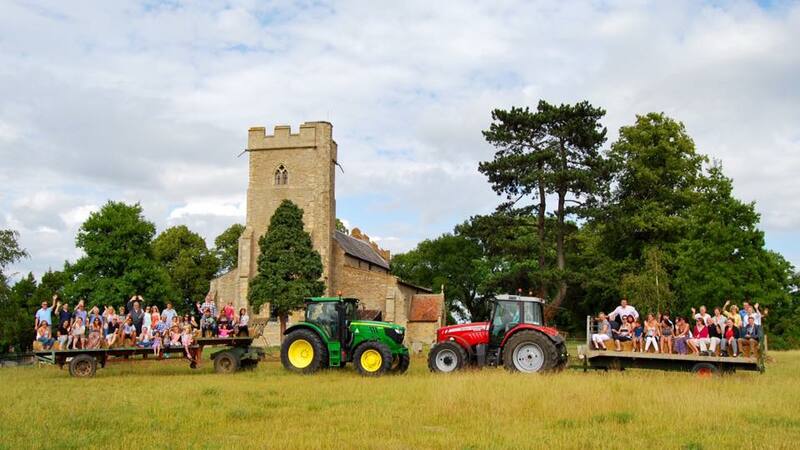 An important ingredient of the Summer Lunch, for instance, is the ever-popular trailer ride round the fields – a chance to learn about the ups and downs of farming life and to enjoy the changing views of the village with the church at its centre. We love to host your ‘life events’ at St Mary’s, too. The church’s location, set high above the surrounding countryside, not to mention its compact format, makes it an attractive option for a country-style wedding, while still being only four miles from Newport Pagnell. The Millennium Hall, operated by the Carrington Arms pub, is the ideal partner venue for a wedding reception. The Holiday Inn Hotel on the London Road is also only a mile away. Anyone from within the benefice of Newport Pagnell with Lathbury and Moulsoe, or with a so-called qualifying connection to the benefice, may marry here. The church’s modest size also makes it a more intimate environment for a baptism, marriage vow renewal service, blessing service or funeral. Its prayer-soaked walls can inspire or provide comfort, reminding us of the many thousands of people who have been here at times of joy and sorrow over the years. Please contact the Parish Administrator in the first instance with any queries about marking your life event in Moulsoe. Please send general enquiries to the churchwarden.